"Many people think of mind control as an ambiguous, mystical process that cannot be defined in concrete terms. In reality, mind control refers to a specific set of methods and techniques, such as hypnosis or thought-stopping, that influence how a person thinks, feels, and acts." 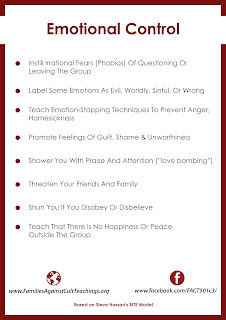 Destructive mind control can be determined when the overall effect of these four components: Behavior Control, Information Control, Thought Control and Emotional Control - promotes dependency and obedience to some leader or cause; it is not necessary for every single item on the list to be present. Emotional Control is probably the most powerful of these four components and likely the one that makes one most vulnerable. Scientology has a something called The Emotional Tone Scale. You can find a picture of this scale by doing a simple google search. If someone is angry or grieving, the idea in Scientology is to "counsel" someone to be as high on the tone scale as possible, which in itself isn't a bad thing, we all seek to be as happy as possible. We all experience various emotions day to day and they are natural and part of being human and there is absolutely nothing wrong with this. It has been reported that inside the Scientology culture certain emotions are looked down upon and unacceptable. Former staff members (clergy) have reported being yelled at, reprimanded and punished for "not being uptone". The term "come uptone" is very common in the Scientology culture. Being reprimanded for having natural human emotions is one way to control the behavior of others (rewards and penalties). Of course this is just one example. The infographic above gives you examples of others. A former Scientologist wanted us to Share her story! A former Scientologist wanted us to share her story. Recruitment: When I was 21, my fiance issued me an ultimatum that unless I joined Scientology, he could no longer even date me. Once I started buying their classes and counseling, I was under constant heavy pressure to become a staff member which means you work 90+ hours per week for about $40 per week. I did join staff and worked there for 14 years. Damaging Aspects: They use force and control and work on getting inside your head until you become "dedicated". Then once you are fully dedicated, they control every inch of your life: who you can talk to or be friends with, what family members you can have a relationship with, all of your intimate relationships are usurped by them. They become your family. 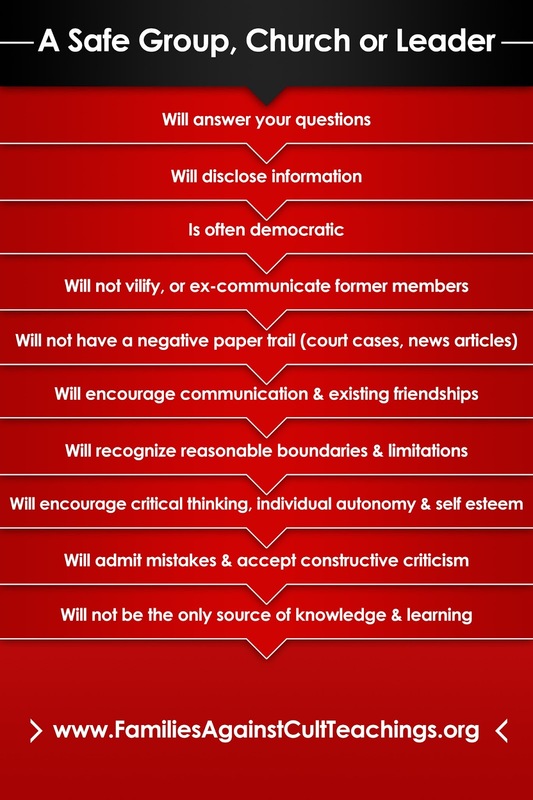 It is a heavy authoritarian, top down structure that issues commands that all who are truly dedicated must follow, or be kicked out and disconnected from all family and friends who are members of the organization. You are encouraged to report on your spouse, your children, your parents, if any of them violate the rules of the organization. You are discouraged from seeing doctors. If you have any serious mental issues you are forbidden from getting professional help, of any kind. All of your mental and physical problems are purported to be cured by Scientology practices. Through L Ron Hubbard's ideology, they completely change your personality, the way you think about people and the world, the way you act, what you do with your life, how you spend your money and all of your beliefs. If you are lucky enough to escape, it takes years to recover and get your own mind and your life back. I was in for over 24 years and it took me many years to become myself again after escaping. It ruined my life, I made huge mistakes and bad decisions while I was under the influence, that I am still paying for today, 12 years after getting away from them. What would you like others to know? : They encouraged me to drop out of College at a young age, even though I was a gifted student. They discouraged me from having children by demanding I work 90 hrs a week. Worst of all, when I decided to no longer be a member, they tore apart my family. There are so many family members who used to be close, loving family members (over a dozen) who now are not allowed to speak to me. They all claimed to have "made their own decision", yet one for one, every single member chose to apply the Scientology Policy of "disconnection" even though I never spoke out about the organization to anyone. So now, 12 years later I am finally speaking out. One of the main ways they keep you in, is to convince you that if you leave Scientology, you will fail, suffer, get sick and die. They claim to be a "religion" yet they offer no public benefit to the world. Their social programs are nothing more than hype and public relations stunts. Its all about either getting money out of you or turning you into a slave for the organization. When you are under their influence it is easy to be convinced that you are saving the world, helping people, and becoming a better person. It happens slowly over time, like boiling a frog, you don't realize it until its too late. Only when you get out and look back, do you realize the control they had over the way you think and see the world. They turn you against science, they turn you against other religions, you stop reading, stop listening to the news, you stop looking at other perspectives altogether. You are only allowed the Scientology perspective, all others are considered inferior. You stop learning, you stop growing or evolving, your mind is no longer your own. You are incapable of thinking for yourself any longer. All the while they are convincing you that the opposite is true, and that you are an "advanced, super human being". How do you feel now being out of the group? My life has turned around and I am happy and healthy but most of all free from that abusive organization. I believe that had I stayed there, I'd be dead. And indeed, I know SO MANY dedicated people in there who have died (usually of Cancer and heart attacks) way too young. Additional: Please publish my story. I appreciate the work you are doing to expose dangerous groups." Thank you for sharing your story! We are Happy to hear she is doing well in life and hope one day she will reconnect with all the family that has disconnected from her! 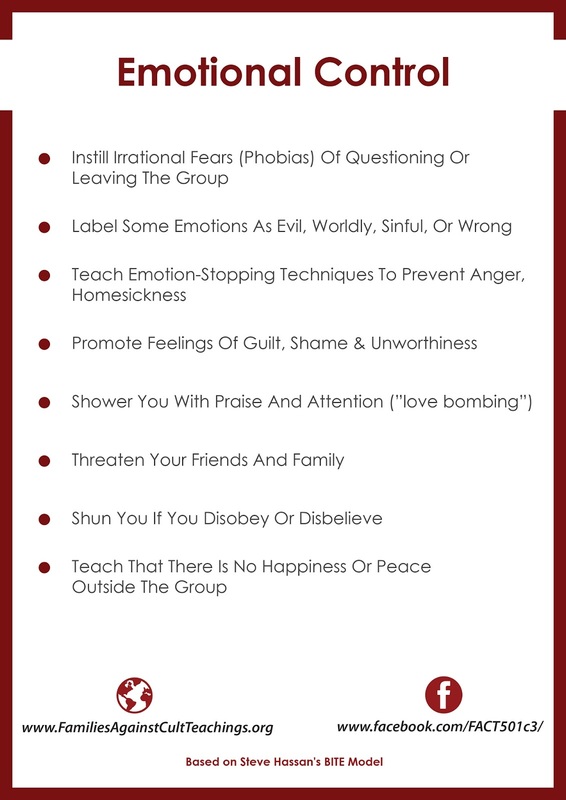 Thought Control based on Steve Hassan's BITE Model. How can anyone control this part of another - How we think and analyze things, process information, our Thoughts? It happens more often than we'd like to admit or think. Commercials and advertising to a large degree control the thoughts and ideas we have about our purchases, what we think we need to have or buy. If our belief system is so strong within a group, leader, church etc, we may fall vulnerable to other's manipulation of our opinions, ideas of what's right and wrong, what is truth and what is not etc. 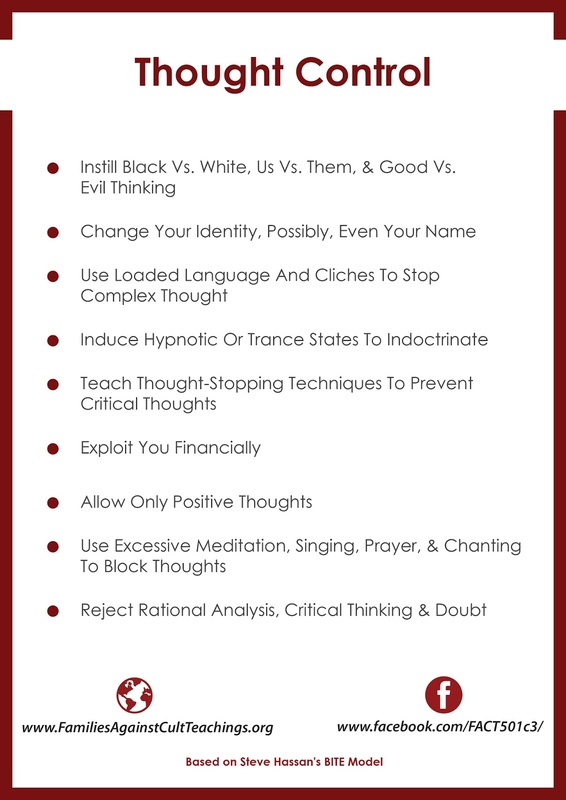 Here is a basic list of what this Thought Control technique is made up of and what to look out for. Please share this info graphic with others. The father of three of Larry Nassar's victims who tried to tackle the former USA Gymnastics doctor last week in court says he will donate more than $30,000 from an online fundraiser created in his name to Michigan groups that help survivors of sexual assault. We can't imagine how this father feels! Based on Steve Hassan's BITE Model. 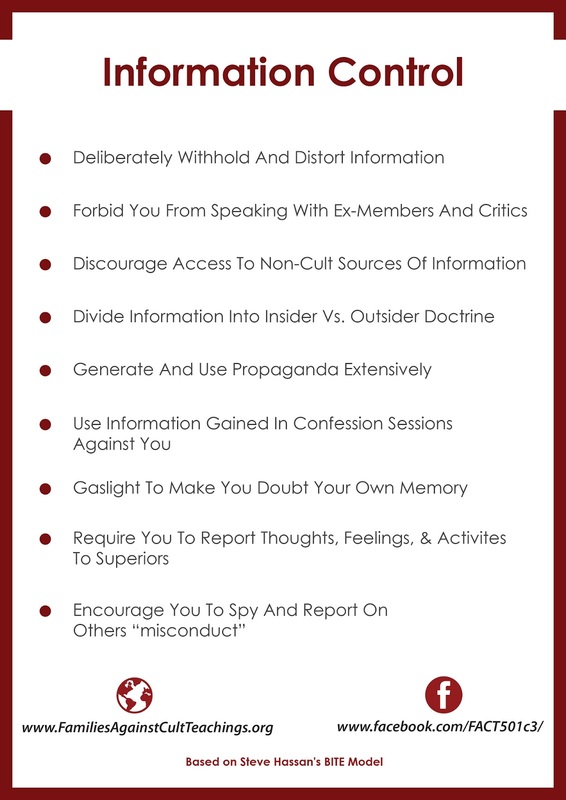 In many groups, such as Scientology, Jehovah's Witnesses etc it has been reported that Information Control is a key component in their policies and practices. 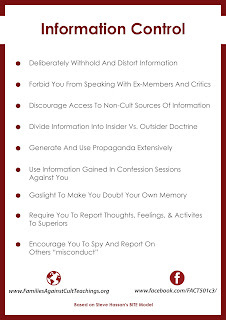 For instance, in Scientology it is quite common for family members and friends to write reports on each other in an attempt to get one "on the straight and narrow or on the program" again. A wife could write a report on her husband for drinking to much alcohol, or a friend may write a report on something their friend confided in them about, such as an affair or a personal issue they are having. Every Scientologist has an "Ethics" file where these reports would go. Scientologists are encouraged to not read or watch the news, they are discouraged from reading or studying anything that isn't Scientology doctrine. Sea Org members (the members who sign the billion year contract) can receive mail, but their personal mail is opened and read before they receive it and if anything negative regarding Scientology is written then the Sea Org member would be instructed to "handle" or disconnect. Meaning, handle the person who wrote the negative comments to the point where they are no longer negative on the subject or they would need to disconnect from them. "Many people think of mind control as an ambiguous, mystical process that cannot be defined in concrete terms. 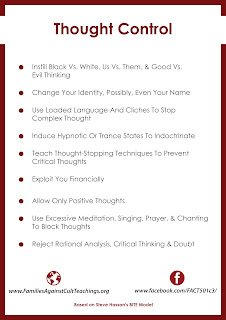 In reality, mind control refers to a specific set of methods and techniques, such as hypnosis or thought-stopping, that influence how a person thinks, feels, and acts. Like many techniques, it is not inherently good or evil. 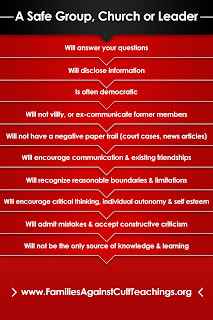 If mind control techniques are used to empower an individual to have more choice, and authority for their life remains within themselves, the effects can be beneficial. For example, benevolent mind control can be used to help people quit smoking without affecting any other behavior. Mind control becomes destructive when it undermines a person’s ability to think and act independently." Please share this info graphic, our blog and website with others. Here is just one example of the Complaints, Pleas for Help & Reports/Allegations we receive on a daily basis. "Solano County abuses families, violates mothers rights and pit our children against us. I still don't know where or what happened to my daughter. Even though she is an adult the government and a 3rd party organization shouldn't be dictating my family members such as my daughter. My daughter was fine at home and there wasn't anything wrong with my daughter living at home. A family is a lifetime event and a relationship that lasts a lifetime. However Solano County has way too many 3rd party family service programs staffed with people who hide behind titles like Youth Counselor, Social Worker, Case Worker that mislead the youth and families. Seneca Center misleads families and the youth everyday and have been misleading and violating the rights of family and the youth for years. No one at Seneca Center is being held accountable for their malicious manipulative influences that have pitted and divided mothers from their children. The director of Seneca Center and the rest of the staff members with Seneca Center create this misleading YouTube videos like they are an organization that helps reunite mothers with their children. But the truth is Seneca Center isn't really reunited mothers with their children. Seneca Center does the opposite, they lure mothers and their children to their offices and gain their trust then they turn on the families and lure the youth away from their home, then don't tell the parents where they lured the youth to go. Then the parents worry, panic and go livid. Then parents call authorities and other county officials and then the parents realize these places abuse the situation even more. Then as a parent or mother your left powerless and stripped of your rights to know where your child ended up. Then years go by and your child is lost in the mix, abused in a adult foster care system that abuses families. My daughter didn't need to be in adult foster care or in a group home ever. Seneca Center and the system use the system to build their careers off the backs of mothers and their children whether they are minor or an adult. Doesn't matter what age they are, people operate non profit family service programs that are geared to abuse and violate the family unit. Solano County California in Vacaville, Fairfield and Vallejo surrounding region is systemically oppressed, because of the local government preying on our families and the excessive mismanaged youth organizations misleading the youth and influencing the youth to flee home with the web of lies and false promises the mismanaged youth organizations feed the youth. That is why my daughter was taken and I haven't seen my daughter for 5 years. 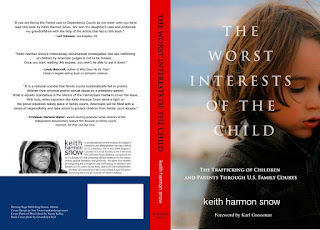 The government and the mismanaged family service programs staffed with people are predators, liars and hoarders of people's family members such as the adult youth and minor children. My daughter was systemically kidnapped, manipulated and then lured to go with staff members from Seneca Center that lied, misled and push their undue influences by wrongly taking advantage of my daughter. I tried to find out and stand up to them then I was left powerless because the system is corrupted by everyone working throughout Solano County. They wouldn't leave me and my family alone. Then they eventually got to my daughter and she was misled by these people. No one listened to me they just judge, make up a web of lies, create false accusations about me and then go behind my back and pit my daughter against me. Then take her and do what they want with her and push their radical agendas on her too. I am not the only mother that had their rights violated by Solano County employees, Seneca Center and other 3rd party mismanaged family service programs that prey on families, mothers and the youth. The group created, Justice for Mothers and Recall Judge Carrington in Solano County California. Where on the map is Solano County, CA ? Solano County is operating like a communist regime. The local government is kidnapping our children and taking them. Then families are tied to a court system trying to get their children back but the judges, lawyers and the Solano County employees are all corrupt using our families to build a career off the back of children, the youth and mothers. Solano County and the people who work throughout the county do manipulative things to pit our families against each other. Then force us to be tied to the system for years on end then they use the youth and mothers where in most cases mothers and children are left powerless because of the overwhelming amount of corruption across the board. " We became aware of this book recently and thought it is a Must for us to Share with all of you. Please remember at this point these are only allegations. If you have any information and/or experience with this either positive or negative, please contact us.